Since the original Beogram CD X was based very firmly on the working parts of the Philips CD104, and manufactured in one of Philips’ factories, when the 104 series of machines was discontinued it became necessary to redesign the CD X. While the outside appearance of the CDX 2 differs from the original model only slightly, internally they were completely different. The new model was based on the Philips CDM2/10 mechanism and the then latest version of their OEM decoder/processor/servo panel, a popular combination capable of excellent results. 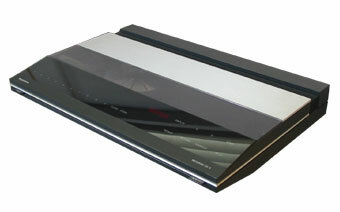 These units also formed the CD section of the Beocenter 9000. Additional B&O designed (but Philips built) panels for power, control panel and lid/tray control completed the machine. The assembly was, as with the original CD X, still built around the chassis casting of the Philips CD100, the first mass produced CD player. Text copyright © Beocentral. Unauthorised reproduction prohibited. Outwardly, an obvious difference was that the power switch had been removed. In place of this, the play sensor and an extra touch control were used to switch the machine in and out of standby. A red LED indicator confirmed when the machine was connected to a power source. In order to use this simple method of control, a complex 4 contact relay was needed. This again was also employed in the Beocenter 9000. Other than this, the rest of the controls and external features would have been familiar to the owner of the original CD X. Text copyright © Beocentral. Unauthorised reproduction prohibited. The move to the new Philips chipset meant that the CDX 2 had a full 16 bit decoder (the original CD X was a 14 bit machine). It is surprising then that the two sound very similar! The digital and servo sections of the CDX 2 use identical chips to Beogram CD 5500, the latter offered improved performance only due to its power supply arrangements and excellent analogue stages. Text copyright © Beocentral. Unauthorised reproduction prohibited. One disappointing aspect of these machines compared to the original CD X was the reliability of the laser. Failure of the laser in the CD X is almost unknown, whereas it most common in all machines (not just B&O) that use the CDM2 series mechanism. Text copyright © Beocentral. Unauthorised reproduction prohibited. By the time Beogram CDX 2 was withdrawn, all the current systems on offer included a CD player, so there was no need any more to offer a separate model not tied to a particular system. Because of this, it was not replaced in the range. Text copyright © Beocentral. Unauthorised reproduction prohibited.